Year 9 Students are close to finishing the first part of their NT Wellbeing Challenge. Students were challenged to write an article for the school newsletter about something students can do to improve their physical and/or mental wellbeing. Students have been learning about a range of Wellbeing strategies during their “Wednesday Wellbeing” sessions during registration time with their form tutors. Some students have decided to focus on writing about an aspect of their emotional and mental health, such as how natural sunlight as something that can help to produce Serotonin which is the chemical that regulates happiness in the brain; whilst others have decided to write about the happiness boosting power of giving, such as when we give to charity (and they have linked this to the school raising funds for the Air Ambulance campaign). Other students have decided on writing about an aspect of physical health, such as health eating and regular exercise. This the the first part of a four part super challenge that is part of the school NT Character programme, which is designed to test aspects of a student’s character (such as their resilience of their responsibility). The remaining parts of the Challenge include creating a poster for the school corridors; creating an audio podcast or song to communicate something about wellbeing; and the final part of the challenge will be to create a video or animation about the topic. 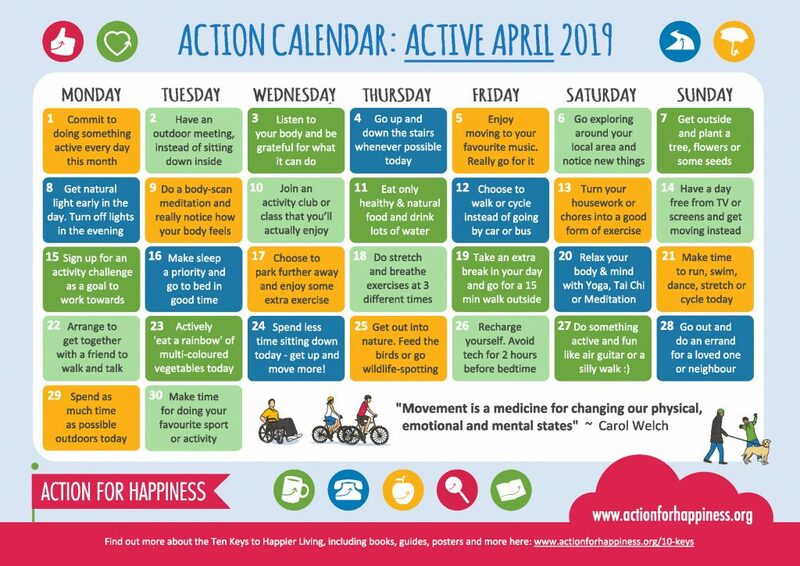 As part of this focus on wellbeing, students have occasionally been challenged to take part in daily tasks set by the Action For Happiness campaign. This month’s daily tasks are based around doing something active for every single day of the month of April. We have attached the calendar of daily tasks if you feel that you would also like to accept the challenge, and do something active with each day this month.